I write all the time about my family, most of all my wife Lisa. That is because she is the center of the universe and has been for the majority of my life at this point. 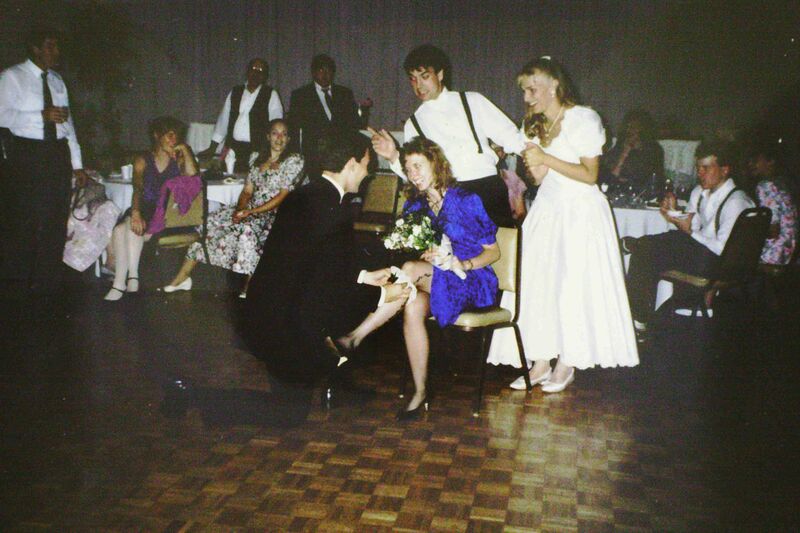 This year we celebrate 22 years of marriage, and have known each other more than 27 years. But there was one pivotal night that could easily have destroyed any chance of a future, but instead cemented our relationship and made us inseparable. I think it is a pretty cool story, and want to share it. This entry was posted in Family by txa1265. Bookmark the permalink. He love/hates this story, but the first time I met my husband was at a flash show at a bar. One of our favorite local bands was doing an impromptu acoustic set and so some friends and I headed there, and we ran into Jeff. They introduced us, and he sat with us during the show. Pretty standard stuff, but the funny part? I totally thought he was gay. I can’t even really say why now, but I think it’s actually a good thing I did. It really let me relax and be myself because I thought there was no potential there! We met up again a few nights later and since our friends told me he’d been asking about me, this time had a whole different vibe and the rest is history! Wow – I really love that story. I strongly believe that sexuality, like most things, exists on a continuum – in other words, hetero / homo is not some light switch that differentiates people, but instead there is a broad range of characteristics that people have assigned male/female to, and that makes our ‘gaydar’ go off. The story also shows how open you are as a person. What a great story! After I met my husband for the first time (I was visiting friends in Baltimore, and he happened to work with one of my friends, and we shared mutual friends from college) he asked a friend for my number and called a couple days later. He later shared that he never asks for girls’ phone numbers ( especially having to get it through someone else) and I never answer calls I don’t recognize, but for some reason I answered his call! Isn’t it funny how such small choices can change everything?! Congrats on 22 years of marriage!! It is funny how these things happen … stuff we wouldn’t normally do, tiny moments that make a huge difference. Really cool! I almost missed out on a first date with my wife. We kind of knew each other and after running into each other one day, she told me to call her over the weekend to go get a coffee or beer or something. (When her friend she was with asked who that was, she joked “Oh, just my future husband.”) But I happened to know that she had a gig on that Saturday, since a friend of mine was subbing on bass for the show. She was vaguely annoyed that I waited so long to call, not knowing that I knew she was busy. Of course, it also would have been nice if she informed me that it was a romantic date, but that’s another matter. I guess this also helped her understand a bunch about you as a person as well. The how and why of handling a situation can go a long way to letting us know whether or not we will be able to stand dealing with someone. Funny story and I can totally see it! I absolutely love this story! You guys are such an amazing couple! Your kids are so lucky to be able to hear this one over and over…I wish my parents had a great meeting story, but theirs is pretty horrible. Great story, Lauren – thanks for sharing. Long distance is tough – we did a year between Boston and Albany, and it really made every moment precious! I’m so glad I went back to read this because it’s so sweet :). Love the story!! When I decided on my college, we had a “pre-frosh” weekend in April before we would move in in September. During Pre-Frosh Weekend, I met a cute guy and stayed in touch with him (by hand-written letters!) over the summer. So, on move-in day, I went to go say hi to him … and Kevin was his roommate :). Haha!! I changed my mind fairly quickly, which was fine because it turns out the other guy found someone else he was more interested in, too! Funny how those things happen! Hand-written letters? Fountain pens on parchment I assume 🙂 When I was a a freshman & sophomore my best friend was a few states away, and we would mail a 5.25″ Apple][ floppy back and forth … which was just as bizarre then as it sounds now! But there was no internet, and our schools weren’t connected through the same set of DARPANET pipes. Love the story about you and Kevin! You just never know!